Polar Bears are large creatures so it is understandable that it takes a great deal of food to fill them up. Their main source of food is the various species of seals that live in the same area that they do. Since both Polar Bears and seals spend time in the water and on land they have plenty of opportunity to successful capture this type of prey. The two types of seals that they consume the most often are the Ringed Seals and the Bearded Seals. Generally they have no trouble at all finding enough food as there are plenty of seals in the Arctic region. The one exception is when those seals start to move out of the area in pursuit of their own food sources. Polar Bears are very patient hunters too. They know that these seals are going to have to surface in order to get air. That is why they will quickly attack with a quick scoop of their claws. They are also known to crush the skull of the seals with their powerful jaws. While they can also hunt for seals on land, research indicates that they very rarely do. They seem to have more success with the hunting process when they do it in the water. They have the element of surprise which makes capturing these seals for a quick meal easier on them. They also don’t have to leave the water where they prefer to spend the majority of their time. The eating habits of Polar Bears change as they get older. When they are young they will consume only the meat of the seals they kill. There is plenty of protein found in that red meat which helps them to grow. As they get more mature and move into adulthood they tend to leave that part behind. They will start to consume the blubber as well as the skin. You will notice that mother’s helping their young to hunt will consume the outer part of the seals and leave the meat for the youngsters. Inexperienced Polar Bears can also be seen foraging for leftover food that others have left behind. What is of great interest is that Polar Bears take pride in being extremely clean. After they are done feeding they will wash their bodies with water and with snow. Researchers believe this is done to remove the smell of the seals from their own bodies because they have a highly developed sense of smell. There are other forms of food out there that Polar Bears will consume if they can’t get to seals. One of them is the walrus. They tend to go for the older ones that are weak or the very young though. They have also been known to hunt for whales in the water as well. They also don’t mind eating the remains of what other predators have left behind. They have a very strong stomach so even food that is in a rotting state can be consumed by them without any adverse effects. While Polar Bears can also consume land animals, they just aren’t fast enough most of the time. If they can find weak or injured deer or rodents though they will consume them. 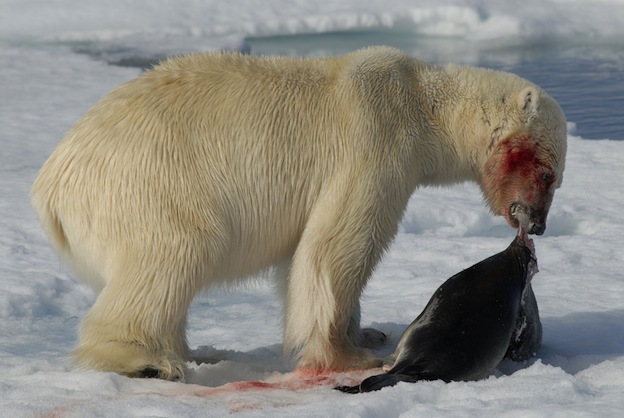 Some reports indicate that Polar Bears can be cannibals to their own species too if desperate times call for such measures in their natural habitat. Polar Bears have a built in mechanism that allows them to go for several months without consuming food when it is scarce. This often takes place during the winter months when it can be hard to get through the layers of ice to the seals underneath. It is still not quite understood what triggers this because some Polar Bears have been known to starve to death while others life off their fat reserves.